This is a quick and rough transcript aided by an auto-transcriber. It will be adjusted and corrected over time. For more information about the people in this presentation, visit: TotheStarsAcademy.com. Tom DeLonge: Early this year I set out to do something pretty challenging. I wanted to shift perception on an extraordinary topic that had already over 70 years of research opinion and frankly quite effective just information. I had the rare opportunity to present my ideas to an executive with the Department of Defense who worked in the special access programs in an area called Watertown also known as Area 51. That meeting led to multiple clandestine encounters across the United States from desert airports to vacant buildings deep with Washington DC from these exchanges I learned three things: one, there are certain things that should never have been secret; two their secrets that were justifiable at the time which should now be disclosed. And three, there are things that are so unimaginable that certain interest that they should never ever be made public. After this you might even Agree. I’m Tom Delonge and thanks for joining us live today. This quote above me actually happened to me this past year. When I was young I dreamt about playing a rock show in front of all of my neighbors. As a seventh grader that seemed unattainable. I never expected to be so lucky as to have a band like Blink 182 in my life. It was something that was much more further out than a dream. It was something not even possible in any scenario that I can think of when I signed my first major record deal. I took my first check, bought a desktop computer so I could research the possibility of intelligent life in the universe. I’d stay up all night cataloguing archiving and highlighting small pieces of data thinking I could find a unified theory of sorts something to make sense out of the many elusive and mysterious events that seem to have interacted with mankind for thousands of years, sometimes for good and sometimes not so much. My passion for the subject helped me envision a more interesting existence for us all; something more infinite and more exciting than the usual. I was a typical middle class kid from suburbia. Except I loved mystery. It was like I was on my own imaginary ride searching endlessly for an answer to all that is, as if there was such a thing. Now in adulthood, I’ve started to use my limited notoriety as a tool, a door opener to meet important people. I also did this while combining all of my entrepreneur early experience over the past 15 years into one company that could keep up with my racing mind. The result was a creative machine to help me discover comprehend and communicate large themes about the human race. I called it to the stars. I created a company that can produce original science fiction stories that inspire entertain and galvanize thinking. You would be surprised to know how difficult it is for the major film studios to create progressive content that is relevant, modern and just plain cool. I’ve met with all of them and their hands are tied in many ways. I believe we’re filling a major void in their content creation space. I sometimes call To the Stars a science fiction Disney but for adults. Our projects are about dreams, the paranormal, consciousness and even a historical fiction account behind the UFO phenomenon and our dealings with it. While the company got on its feet, Blink 182 was unraveling in the press. I was traveling around the country secretly for 18 months at the time. I was working my way through NASA, the Department of Defense and various other agencies, and I couldn’t tell anyone at the time, including the band. Then the Wall Street Journal and some other large news organizations reported a story that some rock star was having video conference calls with senior military and defense contractor officials. And I don’t think people really knew what to make of it at the time but the major news publications definitely started taking notice. Even they didn’t know how I had that kind of access. And over that time period the story of the millennia, as we call it, sat quietly in my head. I started to tell it in the book Secret Machines. Back then, I was even visited by a man and a certain agency. The conversation put me in my place fast. It was the first time I really digested the enormity of the national security implications of the UFO subject. His words were, and I remember sitting in the small room, “When your book came out there were calls coming in from everywhere. You know things you shouldn’t know. And I need to know who the hell you are.” And two days later, I I believe he realized the same thing that all the generals did that I was meeting with. I was respectful. I am humbled by the opportunity. I did everything I said I was going to do. And I was also an advocate for men and women in uniform. Now back to that Wall Street Journal article, that article lured some very important people out of the shadows. Principal players with the highest credentials and resumes. A strategy was developed that I really think can achieve the impossible. You must first understand that the Department of Defense has a culture of secrecy, not out of disdain or distrust for its citizens, but because it’s appropriate to protect the lives of its people technologies and methods, like my own brother who spent a career in the special forces. It’s not in their job description to help you and me understand the universe, past events or why certain actions were taken on the UFO phenomenon 70 plus years ago. They were too busy actually dealing with it. So this brings us to today. I’ve worked for two years to construct a mechanism that I feel is missing. One that can take the biggest secret and the most… the most controversial secret on earth and surround it with three groundbreaking strategies that will innovate, educate and hopefully wildly entertain at the same time. It’s called To the Stars Academy of Arts and Science. We did this, truthfully, as hard as it may be for you to really understand, to define a future and not be victim to one. And that was a service that I offered and that’s also why I received a ticket to meet some very invisible, but also very important, people. Now there is a subject that could potentially change the world. How would one approach it especially if the subject contained earth changing technology, the need to understand a coming tidal wave of information, and what my partners and I call again the story of the millennia. Again, a technology a need to learn more and some stories to tell. Our institution looks to build a perpetual funding machine that can continuously attack those three things; Aerospace, Science and Entertainment. Again, some important stories to tell, a need to learn more and a plan to engineer the technology observed. This is why I am here. This is why they are here. We’re going to bring it to the world and we’re going to show you today how we aim to achieve this. Chris Mellon: Thanks very much. I’m thrilled to be here to be part of this team. I will start by providing a rationale for combining science and entertainment in a single company. What is the underlying unity of these distinct activities. There are two primary methods we used to learn about and understand the world. The first is through stories and the second is rational inquiry. There’s nothing more ubiquitous among humans than storytelling. We require stories to recount our experiences convey information and better understand the world. We’ve adapted our storytelling to new technologies but the vital tech the vital function of storytelling remains the same. Rational inquiry or the scientific method is the other principle means we use to make sense of the world. But storytelling and rational inquiry must work hand in hand for the benefit of society much is the right and left hemispheres of our brain work together. One analytical and the other intuitive in holistic. Albert Einstein identified the underlying unity of art and science when he said quote “The most beautiful thing we can experience is the mysterious is the source of all true art in science.” Now let me discuss the urgency we feel at To the Stars Academy in connection with our dual mission. Precisely sixty years ago this month the former Soviet Union proudly announced its success in placing the first man made satellite in orbit. The news fomented intense anxiety in the context of the Cold War but America was energized and enthusiastically entered an era known as the space race. Space Exploration sees the public’s imagination and we elected to reach for the moon. Sputnik was an unwelcome shot across the bow but it sparked a boom in science and engineering and enrollment in science and engineering courses surged at the same time the public devoured fiction and nonfiction books TV shows and movies on space exploration using those mediums to process the ramifications of the space age. Now imagine for a moment that Sputnik had remained a secret known only to the Soviet Union and perhaps a small group at CIA. There would have been no public outcry or debate. This great boost to space exploration would not have occurred if the public had remained ignorant of Sputnik due to excessive secrecy. It will undoubtedly surprise the public to learn that we find ourselves once again in a race for technological innovation. Permit me to tell you a story in the hope of making this clear. We are presently standing within 10 miles of the home port of the USS Nimitz, a five billion dollar warship with a crew of thousands. It is one of the premier assets in the U.S. Navy. Envision the Nimitz operating off the coast of San Diego on a brilliant sunny day escorted by the USS Princeton, an Aegis class cruiser that protects carrier battle groups by employing the most sophisticated naval air defense system in the world. Imagine these ships engaging in a routine training exercise when an unidentified aircraft with a small radar cross section appears on the radar heading directly towards the battlegroup. The aircraft has no transponder does not respond to radio calls. The Princeton ? contacts two F-18s already aloft to intercept the target as the two F-18s approach the four aviators see that the object has no wings or exhaust. It is white, oblong, some 40 feet long and perhaps 12 feet thick. One pilot pursues the craft of his wing man stays high. The pilots are astonished to see the object suddenly reorient itself toward the approaching F-18. In a series of discreet tumbling maneuvers that seem to defy the laws of physics. The object takes a position directly behind the approaching F-18. The pilot’s capture gun camera footage and infrared imagery of the object. They are outmatched by a technology they’ve never seen. Fearful for their safety and running low on fuel both have eight teams returned to the Nimitz. Yet the strange object remains in the vicinity of the Nimitz for hours, monitored by the USS Princeton and radar aboard a Navy E-2 Hawkeye aircraft. At one point the object soars to 80000 feet, hovers, then drops at supersonic speeds coming to a full stop a mere 50 feet above the ocean where it resumes hovering. More F-18s are dispatched but with similar results. As before the engagement occurs in broad daylight in the secret machine easily evades the F-18s. Dozens of military personnel aboard the various planes and ships involved are privy to these interactions. Bear in mind that naval aviators are the finest observers possible. All have top secret clearances. All are drug tested are ardent Patriots have excellent vision and understand aeronautics and aviation. Clearly this is not an experimental U.S. aircraft but whose is it. How did it accomplish these feats. This story may sound like a sci fi movie but it is a true story and far from being the only one of its kind. I’ve met with one of the pilots and confirmed the account as have other members of the To the Stars Academy team. But the real beauty of this story is that you don’t have to take my word for it or even that of the Navy officer who described these events in an article you can find on the web by searching on Nimitz UFOs 2004 there I was. Better yet the US government itself can verify the events involving the USS Nimitz on November 14th 2004. So the key to revealing whether or not there are advanced vehicles with capabilities far beyond anything made in America is now in the hands of the press and the public. The chairman of the Armed Services Committee and his counterparts and other congressional oversight committees can easily request a briefing to confirm the veracity of this story and the existence of other events of a similar nature. Congress has every right to review the documents generated by this event and request briefings by the military personnel involved. If the oversight committees have not already been briefed on this event and others like it they clearly should be. How else can they adequately assess threats to our forces and our military requirements. There is nothing to prove here. These are just facts that need to be properly evaluated. Without the facts, neither Congress nor our democracy can function effectively. Once the truth is known some anxieties will certainly be raised but imagination’s will also be fired a renewed interest in space and science will inevitably result in our government and society will respond. But we can only rise to the challenge once the public becomes aware a problem exists. Casting our eyes skyward again to the stars is a constructive and unifying proposition for mankind at a time of growing disarray. We are a corporation with a public purpose and we are all about combining the light of reason and passion of art to stimulate new thinking and discoveries. To the Stars Academy provides an opportunity to embark on an unprecedented journey of storytelling, exploration and innovation. This is more than a commercial venture. It is an intellectual adventure. We hope you all will join us. Tom DeLonge: For those of you who are just joining us from around the world I want to welcome you. Today we’re announcing To the Stars Academy of Arts and Science a company dedicated to pushing the outer edges of science and understanding and the understanding of aerial phenomenon. You know I want to take a second here. Months ago I had some very important people from inside the government talking about somebody that one day I would possibly be able to meet. And I remember the words were you you can’t know his name but if you were ever to know his name you would have to keep that to yourself till the day you die. And then I remember there was a big breakthrough where we started referring to this guy by the letter L. Days ago days ago. This person finished his career at the Department of Defense as one of the senior covert intelligence officers in the office of the secretary of defense. I think you need to really listen carefully to what he says. And I still even, working our way up to today, I get the chills when you, when you, when you say it. So I want you to all meet Luis Elizondo. Luis Elizondo: Well thanks Tom for that very special introduction. My name is Luis Elizondo and as a career intelligence officer I am accustomed to being involved in close hold nuance programs involving national security. This includes being a counterintelligence special agent a case officer and an intelligence practitioner. However by far the most interesting effort I was involved with was the topic of advanced aerial threats. For nearly the last decade, I ran a sensitive aerospace threat identification program focusing on unidentified aerial technologies. It was in this position I learned that the phenomena is indeed real. And now as a member of To the Stars Academy we will bring our observations to you. For starters To the Stars Academy is planning exciting new tools and capabilities that allow you and others to effectively take part of what we’re doing and we will allow you to detect analyze categorize and yes even engineer technologies that have remained elusive until now. One of the many ways we seek to accomplish this is through a community of interests, a virtual environment of sorts. This virtual environment provides a platform for the detection and triangulation of phenomena events in real time and allows two way communication between the public and our team regarding this information. My job will be to work as a liaison and an interlocutor in the collection of this information for the science division allowing us to collect facts for analysis. We are also planning to provide never before released footage from real U.S. government systems, not blurry amateur photos but real data and real videos. And we’re inviting our government colleagues and friends and defense to participate regularly with their own findings. Another To the Stars Academy objective is the development of an app that allows you to help us quote unquote crowd crunch the data. Anyone with a cell phone could be alerted to an event occurring in their area. In essence making them a virtual contributor with millions of people documenting events as they actually happen. Allowing us to cross over a new threshold of understanding To the Stars Academy is on the verge of bringing all of us across that threshold together and I am excited frankly like hell to be part of this effort with you. Thank you sincerely for your time. Tom DeLonge: If you just joined us again welcome to the live announcement of To the Stars Academy of Arts and Science. You need to share this for us and you’ll find out why as we go along here. I’m about to bring out one of the most accomplished aerospace engineers in the planet. First time I met Steve Justice I went through, I got the opportunity to go up to Lockheed Martin the skunkworks and I remember I went through this guard gate and they had machine guns and then I first had to get my fingerprints and all that kind of stuff and then I got to go through the machine. And then I go through this door and it’s locked up with security inside another door with electronic codes and more security. I get into a hallway and there’s like hundreds of speakers lining this long hallway with just white noise just static playing to drown out everyone’s conversations. And then there are more doors that were thick as a safe with these rotary locks. You go in there there’s no windows. Very few people. And it’s the elite of the elite aerospace engineers that are building the stuff that comes out that frankly most people think are you a phone in the sky when they see them. I am a kid in a candy store to share the stage with somebody that works on the coolest stuff in the world. I would like to introduce you to the head of our aerospace division, Steve Justice. Steve Justice: Thank you Tom. When when Tom came to visit my office I wanted to talk about rock music he wanted to talk about airplanes and so we had to kind of come to a meeting of the minds there about what the discussion was going to be like. I want you to play back in your heads for just a minute what you heard from Chris and Luis and I want you to think about, you know, these these real people that are involved in this how they’ve been impacted by what they’ve seen the witnesses that Chris talked about Lou himself. And when you ask yourself how can I say this is not real. To me this makes it real and that means it can be done. Means it can be done. So if it can be done let’s trust their position. OK, and one of the things I want to do is figure out what those technologies are in this observed vehicle and I want to build that. I want to build something that absolutely stimulates the imagination. And To the Stars Academy is structured to do just that. The science division of the Academy is designed to go out and collect the information. Connect the dots inside there. You know now we’re going to be collecting from sources all over the place as you heard Lou say trying to connect the dots in there in ways that we’ve never been able to do that before. And the community of interest that you referred to is going to be critical for that. And then we want to try to understand exactly what it means. The aerospace division is going to harvest technologies and understanding from the science division try to go through and demonstrate the technologies build prototypes and even production systems that can change life as we know it. And then finally there’s the entertainment division that Tom talked about where you will walk this journey with us you will participate with us and we’ll inform everyone along the way. We’ll provide education hopefully inspire you to think about the future in a very very very different way. When it comes to shaping the future one of the greatest obstacles you have is your mind. The best example of this that I can give you is an article that I read when I was in college, I guess I saved this magazine, it was U.S. Air Force magazine had an article about flying U2 and I was recently cleaning out my files. And so I thought what else was going on in 1976 so I was looking through it and there was this article about this magical new system called GPS. And someday if the United States really focused on electronic miniaturization the soldier would be able to wear a backpack that weighed 10 pounds and cost $10000 it would tell him where he is on the face of the earth. Now we laugh at that today because we have something that does that, fits in our hip pocket that costs a couple hundred bucks, but it’s also a camera. Oh and by the way that GPS system can also tell you where to go with verbal instructions if you’re lost. But it’s a camera it’s a telephone and it can connect you with information worldwide. Now this author had written that down in 1976 he would not have been allowed to print it. He would have been laughed out of the room. And yet here we are standing here laughing about it. OK. But what we’re doing is we’re standing in his future looking back. He was standing in his present looking to the future and so the whole trick to this is releasing those boundaries that are inside your head to stand inside the future and if you don’t think that you’re susceptible to these artificial boundaries take this exercise with me. If I ask you to name different kinds of ships and you thought of aircraft carrier ocean liner row boat or destroyer, you’re an incredibly well educated adult. Give yourself an F. If you thought of an airship or a spaceship, give yourself a C. I didn’t ask you to name things that float on water, I asked you to name different kinds of ships, and if you thought of friendship ownership a relationship give yourself A, but see how easily our mind will sit there and add rules that are not in place and the whole key to the future is reaching out not placing rules in place that are there. And and and then taking that chance and in all likelihood if somebody is laughing at what you say you’re standing in the future and looking back when we have these glimpses of technology now that tell us maybe there’s a way to go do that. We need to evolve those analyses and realize those technologies for the future. So an example what we may be able to do, the application of this, today is a generation of people that are not buying cars. They’re using On-Demand point to point transportation within cities. Why have a car. Imagine if that was international. You could go anywhere on the face of the earth in a matter of minutes and, just, so now you’ve removed that parameter of distance in time that separates us from from friends on the other side of the Earth. Putting it in a context if we had this technology today. Imagine how quickly we could get supplies where they’re needed for natural disasters delivering directly to neighborhoods as opposed to having to send them on ships in trucks through this chain of supply chain to get it to the point where it’s actually needed. If you don’t think a technology like this can change the future. I want you to imagine this 15 years ago when you imagine it 15 years ago you didn’t even know you needed a smartphone and now you can’t live without it. The technology that we’re talking about is going to enable a future that is difficult if not impossible to comprehend today. We’re setting the stage, To the Stars Academy is setting the stage for this future. OK. And defining a future of this very difficult for us to comprehend. This quote you see on the screen right now with the patent office where he is the head of the Pandavas in this report says that there may be We’re coming upon the arrival of a period when human improvement must end. How dare we artificially limit our future. How dare we do that. There is going to be a bunch of people that are going to give us all the reason something cannot be done. We’re going to be told this can’t be done. We’ve got to we’re going to have to expect to hit obstacles both real as well as created. But we believe in this quest. Absolutely. And let’s make sure that we’re not distracted by those that are living within vinta invisible boundaries. Thank you so much for your time. Hope you join us on this journey. Tom DeLonge: So for all the people out there that are trying to absorb everything that we’re doing. You know we put together a video that kind of summarizes it all together just a few minutes. I’m hoping that this will kind of be the calling card to learn more about what is actually happening here. So right now we would like to play you a video. And and I hope you find it to be emotionally intriguing as well as I found it while we were making it. Tom DeLonge: Have you ever had the desire to look outward to the edge of what is known and unknown. We have the chance to do something revolutionary something that I think has never been attempted before. What if I told you I found a group of like minded people who held senior positions in the U.S. government from the CIA to the Department of Defense to the most advanced aerospace engineering groups within our national security establishment. People who have life skills and collecting and decoding elusive information and they all wanted to do something ambitious something that could help change the conversation about who we are through an unparalleled search for answers that can propel humanity forward. Today we are presenting you with To the Stars Academy of Arts and Science, a public benefit corporation, the first transparent partnership of its kind between the fields of aerospace engineering science and cinematic entertainment a collaboration with global citizens to explore the outer edges of conventional thinking targeting the mysteries of the universe and using them to help unify mankind. Chris Mellon: Humanity is clustered around the campfire surrounded by the shadows of the infinite and cold universe. Tom and the others involved with this enterprise want to take torches stick them in the fire. Go on adventures in the shadows to explore those boundary areas and reveal what’s there. Tom DeLonge: What if scientists were given resources to investigate the boundaries of traditional theory. We could finally pull together a unified study from religious scholars archaeologists quantum theorists physicists and even the most advanced aerospace engineers on the planet. Dr Hal Puthoff: The truth of the matter is we now know. Physics which has been advancing that something like warp drive is not out of the question. Chris Mellon: To the Stars represents an opportunity to reach beyond the normal boundaries of Aerospace to create products that we can call them revolutionary and that’s too mild of a word. Jim Semivan: I’m very excited about this. I think it’s an opportunity for us to take certain topics whether that’s unidentified aerial phenomena or ESP or telepathy and really get to the bottom of it. Dr. Hal Puthoff: Starting as a kid, I’ve always been interested in the actual forefront of physics right at the edge these days and in mainstream physics is really outstripping science fiction. Luis Elizondo: I was in charge of the advanced aerospace threat that deals with highly sophisticated unidentified phenomenon. In the last 10 years, we’ve come a long way in our understanding of our place here in this universe. There are physics that we don’t quite yet understand, doesn’t mean that they’re not real, just simply means that we don’t have the capacity to understand those physics. Chris Mellon: I think we’re all frustrated by the fact that our government and conventional science neglects some of the most interesting and provocative and potentially important issues out there. Steve Justice: One of the things that we must do is challenge ourselves to stand in the future and look back to the present. That’s the key to breakthroughs. That’s the key to changing life as we know it. Luis Elizondo: I think it’s in our nature to go out and explore and report back what we see. The fact is we may not necessarily be alone. Jim Semivan: These things are real. These things are out there. They’ve been out there for a long time. They are not the provenance of the government or any government in the world. They belong to us. These are things that happened to people all the time. And these are things that we need to explore. And we need finally to get to gather up to figure out what this is all about. Tom DeLonge: Using state of the art technology our own advanced research and development programs and unique storytelling experiences. Our goal is to introduce these unconventional subjects and the potential to affect the world positively through a model that innovates educates and entertains to present a positive and unifying message to all generations in every country and every belief system that the growth of consciousness that we all desire if we start here right now. Luis Elizondo: I truly believe now is a time for us to move forward and finally begin to answer some of life’s most deepest mysteries. Tom DeLonge: This is the time that we are inviting you the public to help build a paradigm shift in global movement and to own it with us. Together we can create a vehicle that pushes us forward where we can hopefully learn that we are much more special and much more connected to each other than we could ever imagine. And. We are To the Stars Academy of Arts and Science a public benefit corporation. Tom DeLonge: We’re living in an age where a new universal view of ourselves is possible and revolutionary technology is finally within our reach. If we just have the courage to grasp it and whether it’s trying to launch satellites into space with lasers which we are aiming to do are making major motion pictures that spark the imagination of generations to come. The rule must be the same. No one person one government or one hidden institution should own this information and technology unto themselves and we must relentlessly pursue access to the information that will shape our future. Look very closely at these people and who they are and take notice of where they come from and think about the realities of what this team has the ability to accomplish and deliver if we’re fully equipped and be a part of making history and join us at the start we cannot wait and depend for others depend on others to do it for us. And you have the ability to take ownership from day one and keep all this in the public’s hands. And that is my goal here. You can join us in on a piece of this because that’s what it’s going to take for this to happen. And you have to visit To the stars Academy dot com and click on the Invest button and you will learn about the regulation a equity crowdfunding and this process removes the middleman and democratizes access to equity ownership. Go To the stars Academy dot com you can read the offering circular You can see the business plan you can see the investment opportunities and all the risks involved investing in this type of adventure. 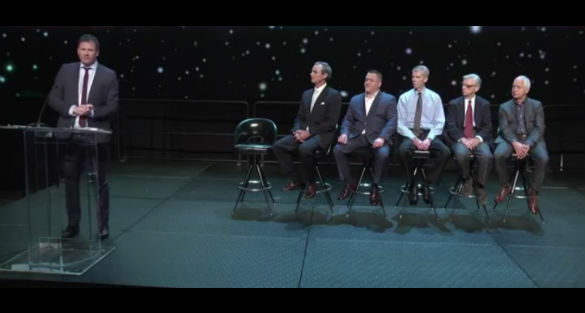 But this may be the only time in history you will ever see one of the biggest aerospace engineers in the world, a senior intelligence officer from the CIA, two former senior Pentagon officials and an experimental physicist from the DRC take a giant leap of faith to tell you something. And I ask that you listen very carefully. These guys really went out on a limb here and the only way to do this is if we do it in the public realm and the only way to bring it out here is if you help us we’re offering you the opportunity to be on the ground floor of building the future. And this is only the beginning. There is so much more coming. We’re making history and I’m inviting you to be wonderfully surprised at what we got in store. Thank you so much. A little common sense. Who still thinks, that we are still, that thermal rockets.